After a seven month journey, the ExoMars mission arrives in orbit around Mars today. Its first order of business? To attempt a historic, daredevil landingon the Red Planet. A collaboration between the European Space Agency (ESA) and Roscosmos, ExoMars seeks to continue the search for biological and geologic activity on Mars, a planet often described as Earth’s little brother and which may have had a much warmer, wetter climate in the past. The first phase of the mission, which arrives today, consists of a Trace Gas Orbiter (TGO) and a Schiaparelli lander. On Sunday, these two craft broke free from each other, and today, they go their separate ways for good. If the lander is successful, it’ll be a historic moment for the ESA—the first time the space agency has made a controlled touchdown on the Red Planet. The big event for the TGO is the Mars Orbit Insertion, a 134 minute main engine burn beginning at 9:09am ET (1:09pm GMT) that’ll cause the craft to shed some 1,550 meters/second of velocity; enough to be captured into a highly eccentric orbit. If successful, it’ll be the second time the EU has placed a spacecraft in orbit around Mars. TGO will then spend the next year using aerobraking maneuvers to lower itself into a circular orbit some 250 miles (400 km) above the Red Planet’s surface. In December 2017, its main scientific mission, of sniffing out traces gases like methane in Mars’ atmosphere, will begin. ESA fully expects the orbital insertion to go off without a hitch. 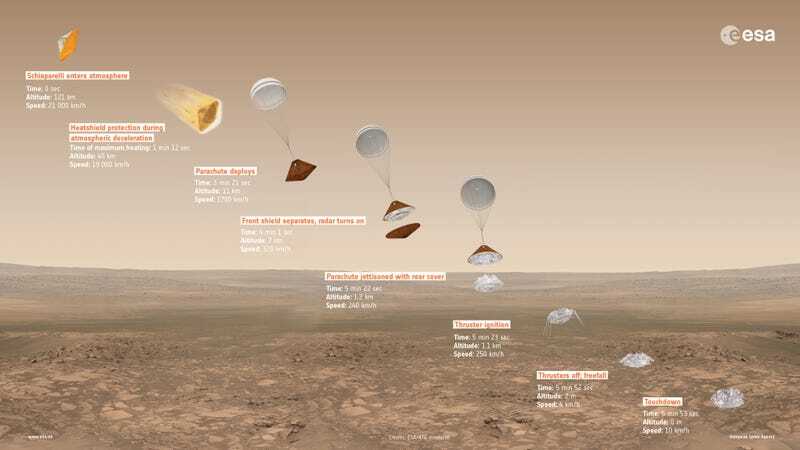 Much less certain is the fate of the Schiaparelli lander, which will try to reach the surface in one piece in order to demonstrate entry, descent and landing technology the space agency will use to send a bigger, mobile rover to Mars in 2020. Schiaparelli’s only got one shot at this, and every step in a complex sequence of instructions has to go off perfectly to make it happen. Otherwise, the lander winds up a pile of rubble on the Red Planet, or a piece of wayward space junk in Mars’ backyard. At 10:42am EDT (2:42pm GMT), the lander is expected to make a ballistic entry into Mars’ atmosphere, at a speed of approximately 13,000 mph (21,000 kph). After a few minutes of fiery free-fall during which the lander’s precious instruments are protected by a slowly-vaporizing aeroshell, Schiaparelli will have slowed to around 1056 mph (1,700 kph) and be situated 6.8 miles (11 km) above the surface. At this point, a parachute deploys. The heat shield is released, and the craft’s Doppler radar is activated in order to determine distance to the ground and relative velocity, information that’ll later be used to activate the thrusters. Finally, at an altitude of a little over 0.6 miles (1 km) and a speed of 155 mph (250 kph), Schiaparelli jettisons its parachute, ignites its three hydrazine thrusters, and descends to a height of 6.5 feet (2 meters) above the surface. The thrusters are then cut, and the lander drops, crunching into the ruddy soil at approximately the speed of an average runner. Start to finish, the entire sequence takes just under six minutes. Did I mention there’s zero margin for error? All ESA can do during these nail-biting moments is monitor the lander’s progress as closely as possible. 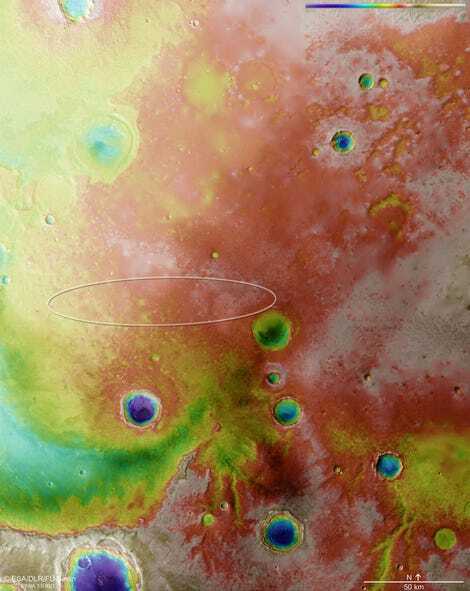 To that end, the Mars Express orbiter will be listening for signals from Schiaparelli, as will scientists using the Giant Metrewave Radio Telescope located near Pune, India. During its main engine burn, the TGO will also be picking up radio signals from Schiaparelli, which will be stored aboard the spacecraft and analyzed later. If the lander is successful, it’ll be a historic moment for the ESA—the first time the space agency has made a controlled touchdown on the Red Planet. (Although it lost communication with the Earth before crashing, the Beagle 2 probedid make it to the surface in 2003.) And while Schiaparelli is mainly a technology demonstrator, it’s got enough battery juice to stay alive on the surface for a few days, collecting meteorological data and hopefully, beaming back some sweet footage of its harrowing descent. Happily, those of us without direct access to a spacecraft or a radio telescope can still follow along via the interwebs, with live coverageprovided by the ESA starting today at 9am EDT (1pm GMT). Text updates on the Schiaparelli lander and the TGO are being issued here, and via Twitter @esaoperations, @ESA_ExoMars, @ESA_TGO and @ESA_EDM. Tomorrow, a follow-up press conference beginning at (oof) 4am EDT (8am GMT) will give us a full status report on Schiaparelli, along with photos to prove the landing wasn’t faked. The action starts pretty soon, so grab some coffee, settle in, and watch the ESA try to make history. Update 11:14am ET: Well folks, the first signal from Mars Express that could have confirmed a successful touch-down apparently never came. According to ESA, a signal from Schiaparelli was traced to “near the arrival on the surface of Mars,” before mysteriously cutting out. However, we shouldn’t despair: a TGO telemetry transmission, due in less than an hour, could offer more information. Other sources of data are expected to trickle in throughout the day. This doesn’t mean the lander failed, we simply don’t know its status yet. Let the nail biting wait continue. Update 12:40pm ET: We just received word that the TGO signal is coming in loud and clear. The ESA has two satellites around Mars! Guess we’ll just have to keep waiting.